Richard Hicks, better known as Ern was a son of George Hicks and Janet Herd and was born in 1889. George and Janet were married in Deniliquin in 1879 where their first child Julia was born in 1880. They eventually moved to the Flowerdale area where Richard attended State school during the 1890s. By 1903, George and Janet had moved to Cathkin near Alexandra. Only a few years after they moved to Horsham, however, the 1909 Electoral Roll shows Janet living in Wilson Street, but George wasn’t. While in Horsham, Ern worked at the Horsham Butter Factory, an employee for over three years possibly as an engine driver. By 1912, Janet had moved to Digby Road, Hamilton. Her children were living with her and Ern was still working as an engine driver. 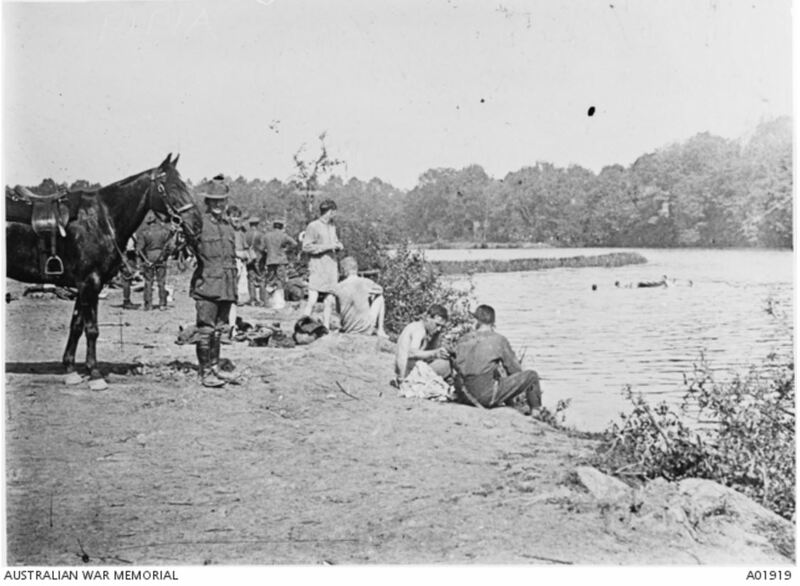 On 5 August 1915, Ern enlisted in Melbourne and went to camp at Flemington on 16 August. He left Australia for Egypt in November 1916. 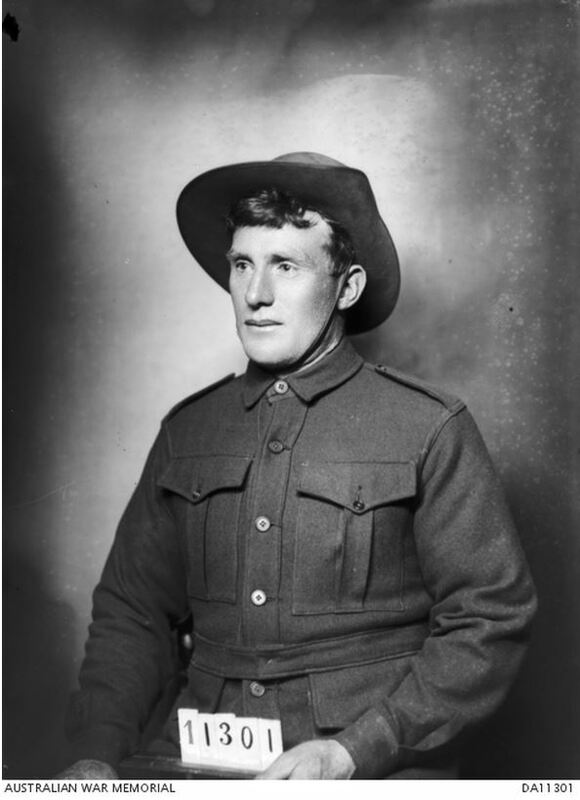 On 23 February 1916, he transferred to the 58th Battalion before moving across to the newly formed 14th Artillery Brigade as a gunner with the 53rd Battery. During his stay in Egypt, Ern sent his mother the following poem, published in the Hamilton Spectator on 9 March 1916. 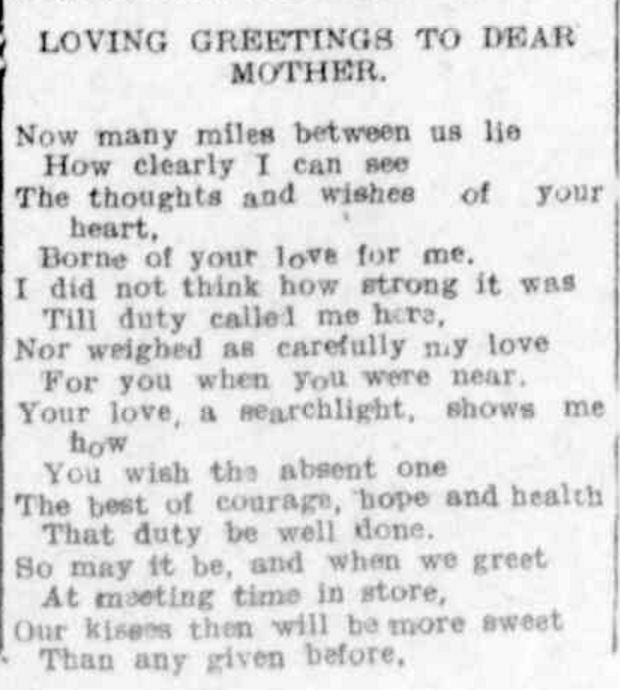 “SOLDIER’S GREETING TO HIS MOTHER” Hamilton Spectator (Vic. : 1870 – 1918) 9 March 1916: 6. <http://nla.gov.au/nla.news-article133694367&gt;. 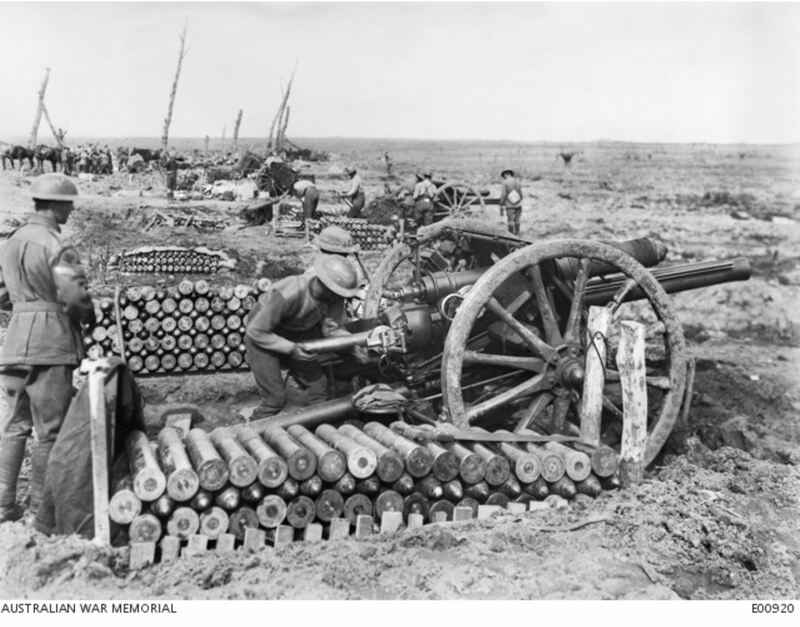 The brigade arrived in France on 3 June 1916 and spent time around Fromelles and Fleurbaix during July 1916. On 21 August 1916, Ern was evacuated to hospital but was able to return two days later. 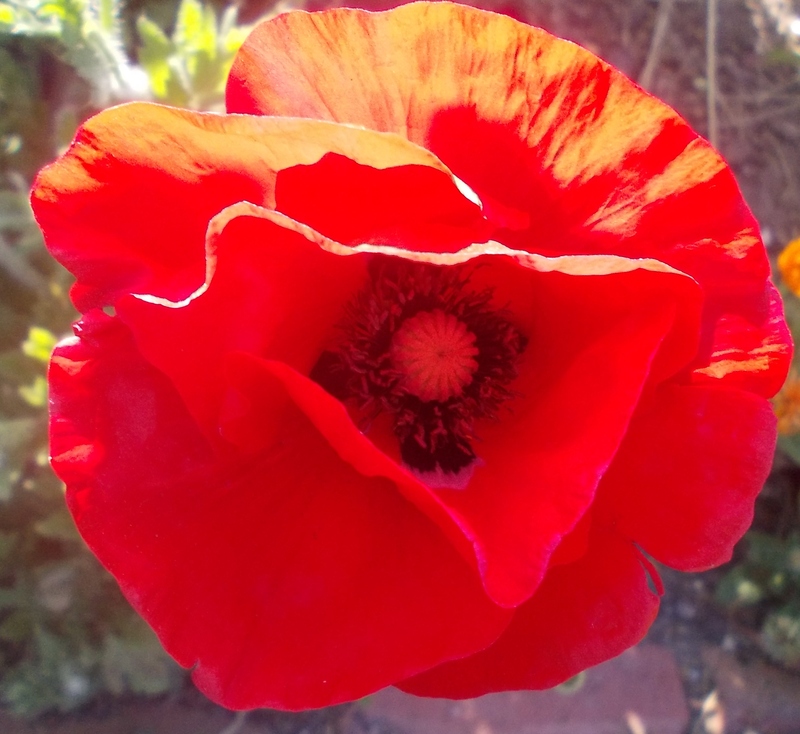 On 17 March 1917, he had problems with rhinitis and spent time away from the brigade until May 1917. By August, they were near Ypres, Belgium and the following month, Ern took two weeks leave. 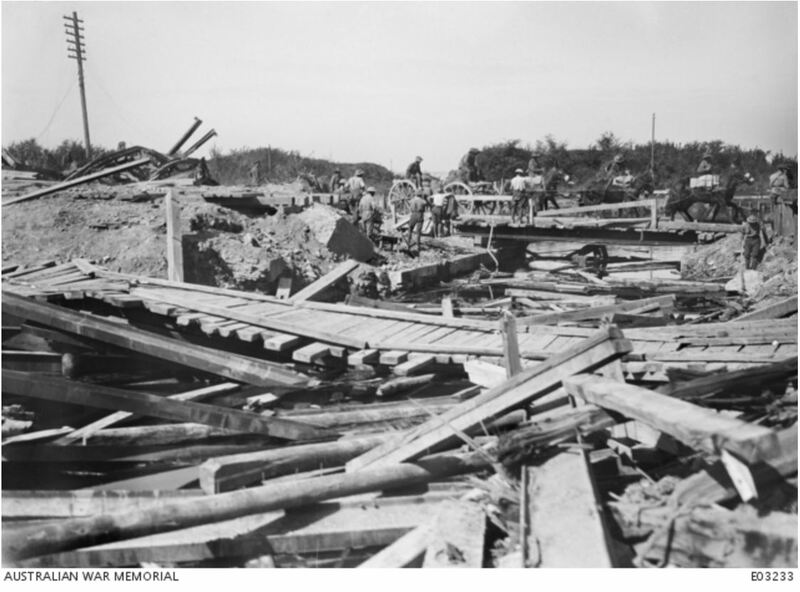 On 21 April 1918, the brigade was near Hamel, France. The brigade’s diary told the story of the day, “…the enemy aircraft were active and an enemy plane was brought down by the Lewis gunners of the 53rd Battery.” The pilot of that plane was none other Captain Baron von Richter or the “Red Baron”. By June they were situated at Querrieu, France. On 6 September 1918, they crossed the Somme and moved into the town of Peronne, France (below). By October 1918, the brigade was at Busigny, France fighting alongside the Americans. On 17 October, Ern was positioned on the wagon lines near Busigny in a forward gun position. There was an air raid and a piece of shell struck Richard in the abdomen. Some of the men in his battery thought he would survive. Want happened to Ern from that time is vague. Stretcher bearers Sergeant Row and Jack Somers were reported to have carried him to a private house where an American doctor dressed his wounds. He was still conscious but not talking. From there, the Australians lost track of Richard and he was reported missing. She did not find out officially until the middle of 1919 that Ern died on 17 October 1918. The stress was seemingly too much. Janet died in May 1921 at sixty-four. Richard “Ern” Hicks is remembered on the Hamilton War Memorial.